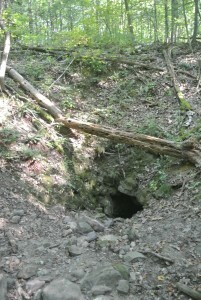 It is no secret that there is a good sized cave somewhat off the beaten path, in Weybridge. 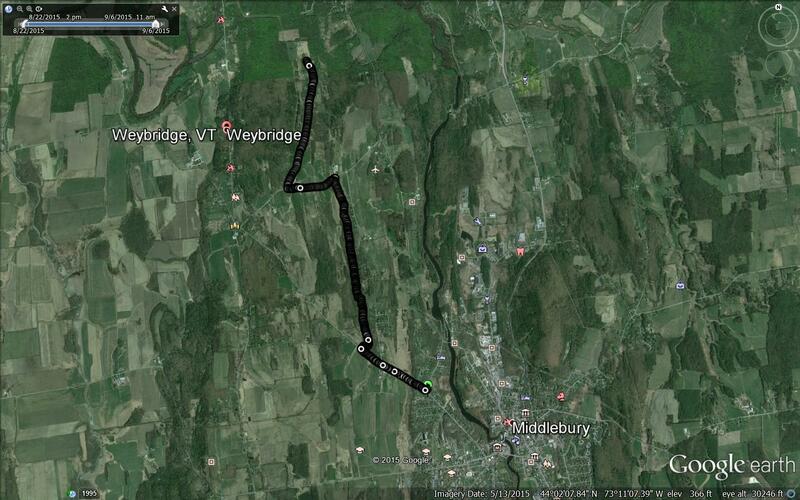 After all, there is a “Cave Road”, and if you look at maps of the area, you will see a “Weybridge Cave State Park” out there, although it is not alongside any major roads. Realizing this cave, purportedly the second biggest known cave in New England, was within running distance of Middlebury, I thought I would try to figure out more precisely where it is, and make a run for it. Of course, I did what everyone does, and tried googling for its precise location, and found nothing! I have never spelunked, at least in public, but according to what little I know of this particular pastime, those who participate in cave exploration are sometimes reticent about openly publishing all the gory details of how to find their favorite holes in the ground. 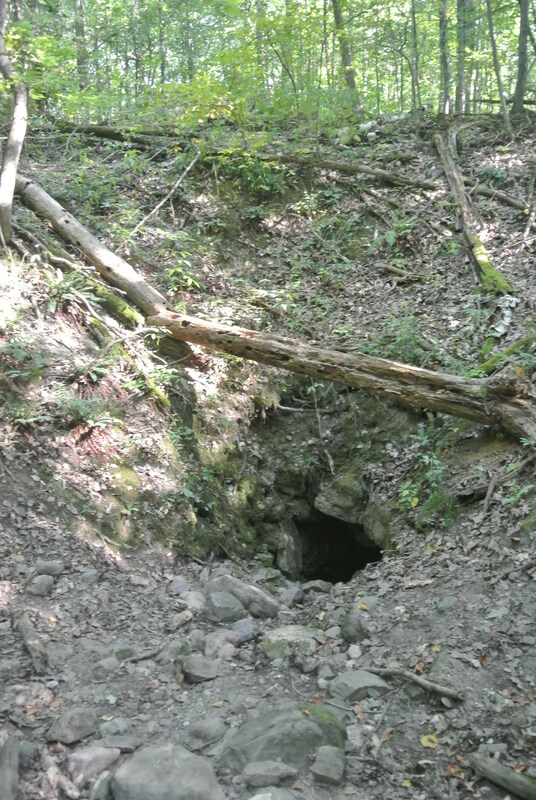 With this, I realized that I had to find this particular cave the old fashioned way – actually talking to people. Like from the bad old days before Google! I parked my car in the small parking lot at the corner of Weybridge St. and Pulp Mill Bridge Road, and set off on Weybridge St out of town, until I came to the right turn onto the segment of the TAM known as the Jackson Trail a short distance later. This is a fun little segment of trail – it goes through a heavily wooded gorge with a small stream for the first mile or so, and the second half of the trail emerges into open fields for the better part of a second mile before reaching Hamilton Rd. The wooded section has some challenging footwork due to the fact that much of it is on the side of a hill. Earlier in the summer, the field portion can be quite muddy, but on this pleasant Sunday morning, it was a dry run, made even nicer by the wind rustling the dense cattails alongside the trail. Emerging onto Hamilton road, I took a left turn, and passed by a farm full of what looked like a bunch of very happy cows! They were all having breakfast, munching away happily from their common trough, when this random runner (me) came up to them and shouted “look up ladies”, and of course they all looked up, clearly obeying my command so that I could get their family portrait. 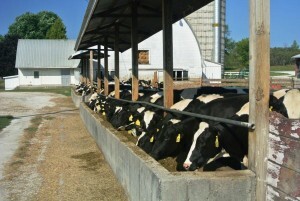 Who says cows aren’t smart? Shortly after this, I came to the point that allows most locals know that we do, indeed have a cave -Cave Rd, where I took a right turn,and followed the road to its conclusion about a mile later. Cave Road makes a tight turnaround loop at this point, but stay left, and take Lafontain Lane, which is conveniently not signed, but it is the road which is NOT Bunny Lane, which is conveniently signed, and is the only other road. You will know you are on the right road if you look to your left and see a home with a confederate flag as a window shade. Yup – we still have a few of those in Vermont! 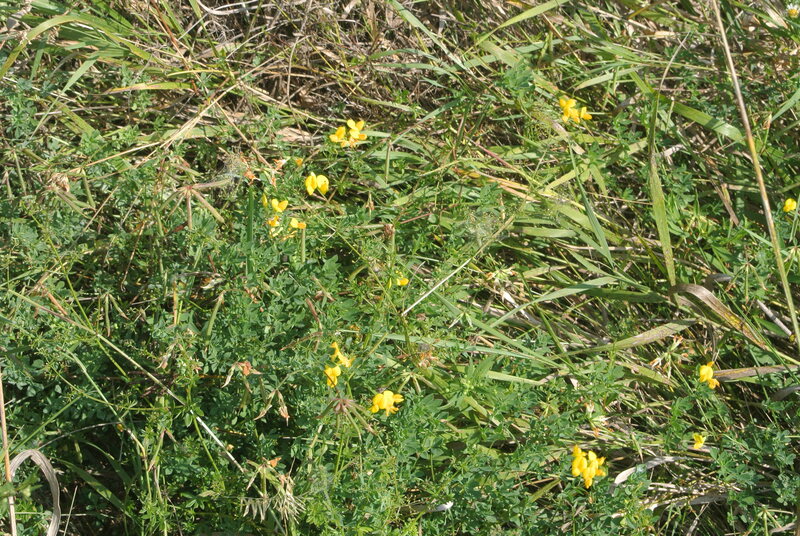 About 50 yards down the road, you will see a fork in the road, and a No Trespassing sign. Stay left here, and you will shortly enter a large cornfield. Once you are in the State Park, you are no longer on private property, and I have been assured that the landowners have no objection to allowing passage to respectful individuals who don’t block passage by parking their cars here. This is also where I turned off my GPS watch for a while, in keeping with the apparent cavers’ sense of not making it too easy to find cave entrances. I, on the other hand, had done my homework, and had a good idea where to start looking for the cave entrance, so I wasn’t looking for a needle in a haystack at this point, and I was a little bummed when I realized that once I was close, the easiest way to find the cave entrance was simply to follow the trail of trash and beer cans. It wasn’t just the usual can’s of Bud Light which tend to litter most roadsides – I saw a few empty cans of Vermont’s favorite cult beer, Heady Topper. So, apparently, spelunking, littering, and expensive microbrews are all part of the experience. Who knew? Following the trail of debris, and armed with a Geology 101 understanding of cave topology, I was able to locate the cave entrance. I had no desire to crawl into the cave on this trip, as it was dark, cold and wet in there. Also, it apparently takes a few rappels to get to the cave floor. Maybe someday with a friend who is appropriately equipped the guide me in? A few years ago, an unprepared explorer tried to climb in, and fell, injuring himself, and required a rescue. After achieving my goal, I retraced my steps back to the end of Cave Road, where I turned my GPS watch back on, and began my return. Looking for a different return route, I took a right turn onto Hamilton Road, until I reached Weybridge Hill, where I realized that I had never stopped to see whose name was on the obelisk in the town green. 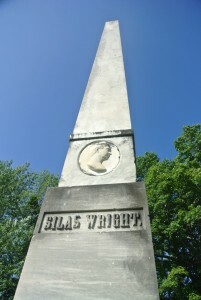 The monument is inscribed with the name and the bust of Silas Wright, a Middlebury College alum from Weybridge who became a congressman and governor of NY after his graduation. Funny how everything sculpted in marble looks like an artifact of ancient Rome after a few years, huh? 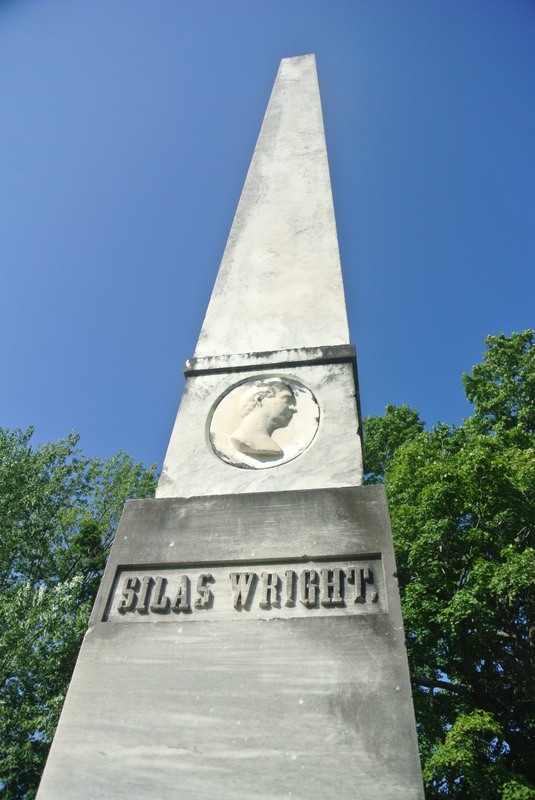 This obelisk also serves as the inspiration for Monument Farms, the local milk producer. 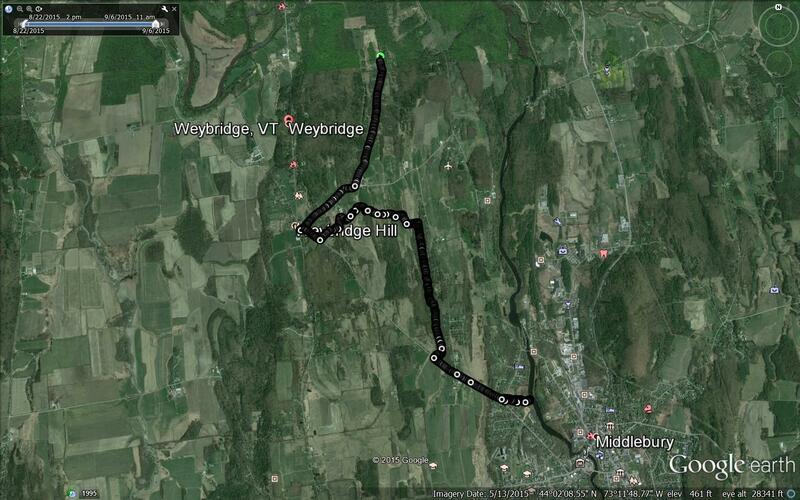 From here, I continued back towards Middlebury for a few hundred yards on Weybridge St, but instead of coming home on the road, I took a left turn onto the new segment of the TAM, which connects the main loop of our trail to Prunier Road and Snake Mountain. This short section of trail was also created to connect the TAM to the North Country Trail, a long distance trail which currently has Crown Point as its eastern terminus. The next mile on this segment of trail, passing through a mix of forest and farm fields brought me back to the main loop of the Jackson Trail segment of the TAM. 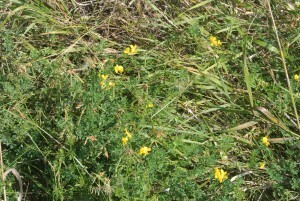 I was pleasantly surprised to see a healthy little patch of buttercups, which I usually think of as more of a midsummer wildflower. At this point I could retrace my steps the mile and a half back to my parked car, where I did the short run down to the shore of Otter Creek, to bring my mileage for the day up to about 10 miles. Since apparently chocolate milk is considered the latest and greatest recovery drink after long runs, it seemed only fitting that I chugged a pint of Monument Farm’s legendary offering when I got home from the run.